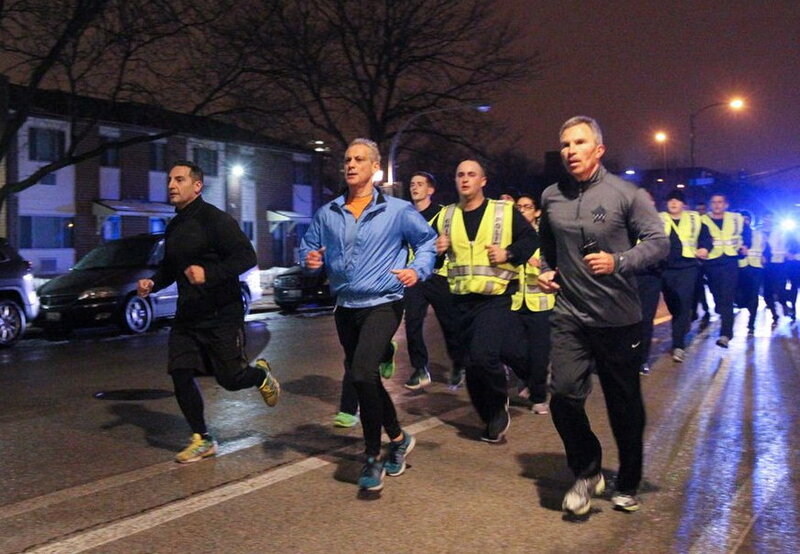 Mayor's Office image of Rahm Emanuel jogging with police recruits in March 2017. 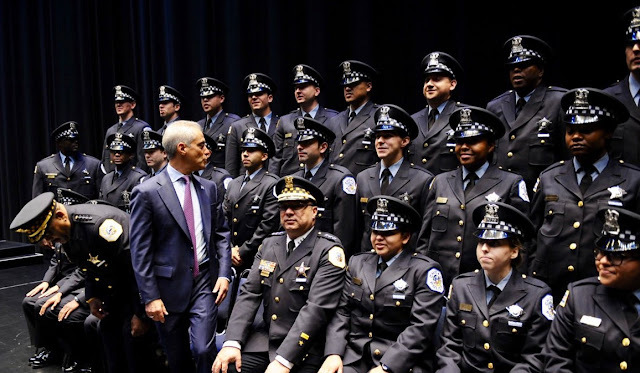 Nearly one year into Chicago Mayor Rahm Emanuel's promise to increase the Chicago Police Department force by 1,000 cops, the city had gained just 37 officers, according to data secured by CWBChicago via a Freedom Of Information Act request. And since his promise was made, 17 of the city's 22 police districts have lost manpower, not gained it. On September 21 last year, Emanuel promised that the city will replace every cop who retires and will further increase the department’s manpower by 1,000 cops overall before the end of 2018. But the city's own data--comparing manpower on the day of Emanuel's promise with the day of our request for information (July 21)—shows the city is falling far short. Graduations have barely kept pace with retirements and promotions, the numbers show. Since Emanuel made his promise, Chicagoans have been awash in a seemingly endless river of footage showing the mayor at CPD graduation ceremonies and jogging with legions of new recruits. But, as of July 21, all of the hype had resulted in a net gain of just 37 cops. Another promise, to increase the number of detectives by 266 is faring better, with the department's three detective divisions increasing by a total of 174 investigators since last September. Police units that saw the greatest increases in strength were the Area North and Area Central detective units; the recruit training division; and the Area Central Bureau of Patrol. But the units that lost the most manpower are largely in what's called the “backbone of policing"—Chicago’s 22 police districts. The district units are on the front line, handling day-to-day patrols and responding to 911 calls. In the violence-ripped Englewood District, there are 55 fewer cops than when Rahm promised to add 1,000 officers citywide. Englewood lost more cops than any other ongoing unit in the entire department, according to the city's data. And the 10th (Ogden) District lost 38 officers; the 4th (South Chicago) lost 27 and the 2nd (Wentworth) is off by 26. The 18th District, which protects the heart of Chicago's tourism district between the Chicago River, Lake Michigan, and Fullerton lost 21 cops. The 19th District, spanning from Fullerton to Lawrence and the river to the lake, lost 15. Fewer cops translate directly to slower emergency response times and greater frequency of so-called “RAP” events. RAPS, or “Radio Assignment Pending” status means that a district does not have any police officers available to handle incoming calls for emergency service. But if you’re frustrated with the fact that your local police district is losing cops while politicians keep talking about how many “new cops” there are, don’t bring it up. Across the city, police commanders—nearly all working with fewer officers than a year ago—have been instructed to shut up about their manpower needs. At a recent 14th District Community Policing meeting, officers were forbidden to speak about district manpower numbers. Instead, they bounced the question to an alderman who was in attendance. The 14th District serves Logan Square, Avondale, Bucktown, and Wicker Park. CWBChicago’s FOIA letter sought the department's total manpower by unit on or about September 21, 2016, and on July 21, 2017, for comparison. Our request, filed on July 21, was answered on September 1, two days after CPD says it swore in 182 new cops.